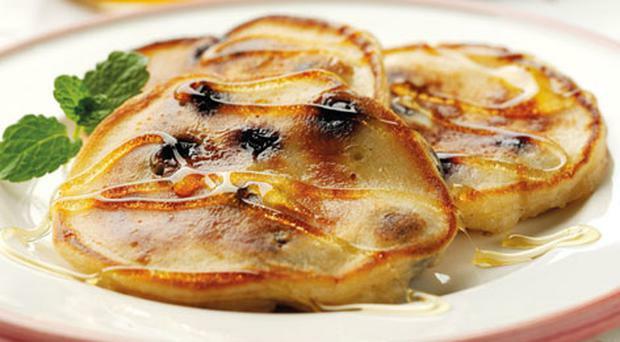 It's Pancake Tuesday and here's some delicious recipes to help make the perfect pancakes for you and your loved ones. Master this basic batter for a super Pancake Day and enjoy with a variety of sweet and savoury toppings and fillings. Sift the flour into a large bowl and make a well in the centre. Crack the eggs into the well and whisk, drawing in the flour from the sides of the bowl. Gradually add the milk and continue whisking until you have a smooth batter. Leave to stand for 30 minutes. Line a baking tray with nonstick baking paper. Preheat the oven to gas 1/4, 110°C, 90°C fan. Brush a 20cm frying pan with a little oil and warm on the hob over medium heat. Add a tbsp of the batter to the pan, tipping gently until it coats the base in a thin layer. Cook for 1-2 minutes, until golden, then flip the pancake and cook the underside for 1 minute. Transfer to the baking tray and keep warm in the oven. Repeat to make 12 pancakes, adding a little oil to the pan before each addition. Serve with your favourite topping. Why not try stewed rhubarb with soured cream and maple syrup, pear with chocolate sauce and hazelnuts, or blueberries and maple syrup. Place the flour in a large bowl. Whisk in the eggs and honey, then gradually whisk in the buttermilk and 1 tbsp oil to form a thick batter. Heat a little extra oil in a pan and, using a tablespoon, spoon some mixture into the pan to make 4 pancakes. Cook gently for 1-2 minutes each side until golden and cooked through.